Well not quite a million as well over 1000 have been converted to Exocets and no doubt many 1000's more will follow the MEV recycling route. 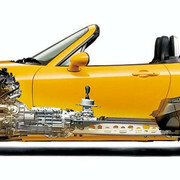 Now celebrating it's 30 th birthday, the MX5 is as popular as ever. Mazda made a car that was Cheap, Light and Good - you usually only get two of the three! Wow.. that is an impressive number! Congratulations Stuart!